Growing Hibiscuses are quite easy to do and requires minimal effort. Having these tropical plants in your garden will bring a playful vibe. The large colorful blooms will appear to dance among the lush green leaves. The best part is that you can display these Hibiscus plants in a variety of ways. Here are some examples: a hedge in which you decide the height, in a charming pot, prune the branches and leaves to form a small tree or let nature take its course and grow wild. Whichever way you decide to show off your tropical Hibiscus you will get plenty of complements on its beauty. There are two ways to plant your tropical Hibiscus: in the ground or in a pot. They are considered a tropical plant so if you live in a climate that freezes you would need to keep them in a pot or consider the Hardy Hibiscus. Keeping them in a pot will allow you the freedom on moving the plant when temperatures begin to drop. Living in warmer climates that rarely freeze and barely hit 32 degrees a couple times a year, have the option of planting Hibiscus in the ground. 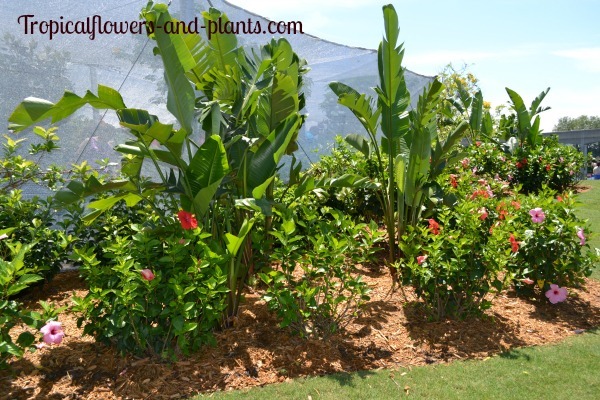 Take your time planting your Tropical Hibiscus in the ground. Follow these simple steps for the proper planting procedures. 1) Dig a hole a few inches wider than the container your growing Hibiscus plant is currently in. While digging your hole make sure to break up the ground around the hole. This will allow your Hibiscus plant to grow longer and deeper roots. 2) Add some water to moisten the hole before placing your Hibiscus plant in the hole. 3) Remove the Hibiscus plant from its current container. Be careful not to rip the roots. If the plant isn’t budging you have two solutions. You may carefully cut the current container it is in. Place pressure (squeeze it) around the container. Placing pressure on the container will loosen the compacted soil inside of the container. 4) Place the Hibiscus plant in the hole and rotate until you are happy with the position. 5) Fill the hole with soil. Make sure the soil is somewhat compacted. 6) Water extremely well to make sure the water reaches the root-ball. 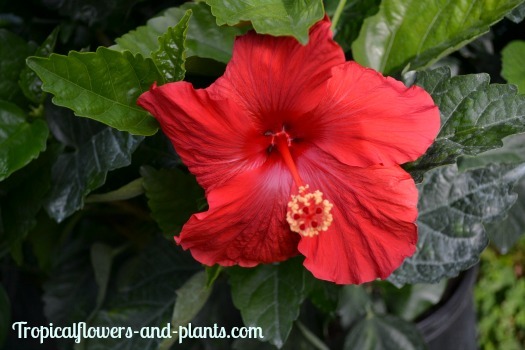 Watering plays an important role when growing Hibiscus. To achieve bright blooms, rich green leaves and an overall healthy tropical plant, plenty of water is a must. Tropical Hibiscuses originate in tropical or coastal areas were the rainfall is ample and the air is humid. These water lovers contain large leaves and blooms that are full of moisture. If your climate does not fall in that category you will need to mimic the tropical plants natural settings as much as possible. When discussing the best watering techniques you need to consider the area that you live in and how much effort you plan on giving your tropical plant. 1) Hose: You are in control of the pressure and time. When using this method, make sure you water each plant thoroughly. The idea is to spend enough time with each plant so that the water soaks all the way to the root zone. 2) Sprinkler: Usually covers a large area for a certain amount of time. Make sure when using this method that plants are receiving enough water. 3) Drip system: Delivers water through a network of pipes in a slow drip manner. Water is sent directly to the plants root area. The Drip system allows the plant to absorb the water instead of runoff occurring. 4) Watering can: One of the oldest methods used. The portable container allows you to water plants by hand. Throughout the different seasons you will notice that your watering patterns will change. Keep in mind that summer time watering will be completely different than winter watering. Besides the change of seasons, temperatures and rainfall will also play a role in how often you should water. Growing Hibiscus especially Tropical Hibiscus, normally do not grow in cold temperatures unless they are in pots. These tropical plants have no idea what to do with excess water during the winter months, so be aware of how much water you are giving them. If a cold front is coming through try and water before it happens. This will allow the plant to keep moisture and prevent it from becoming even more stressed out. During summer time in South Florida I water my tropical plants every other day. If temperatures are extremely high I will water every day. In the winter I cut back and may water 1-2 times per week depending on how wet or dry the soil is. Drier, hotter, windy, sunny conditions tend to dry out the soil quickly. Cloudy, cooler, rainy circumstances make the water last longer. Plenty of rainfall means you can skip the watering. Over watering may drown the plant. To determine how much water you need depends on how much will thoroughly wet the soil around the roots. When a growing Hibiscus is receiving plenty of water, you can tell by all the green foliage and the ample amounts of blooms. However, when the Hibiscus plant does not receive enough water the plants growth and flowering begins to slow down. Eventually the tropical Hibiscus will begin to wilt. At this point you can still save the plant by adding water and keeping an eye on it. The bad part is that the future growth and flowering will be affected. I found when watering my growing Hibiscus I will water them once and as I finish with my other tropical plants I go back and water them again. This way I know the water is making its way down to the root ball and not just soaking the surface. Remember every tropical plant is different so do what is best for yours. 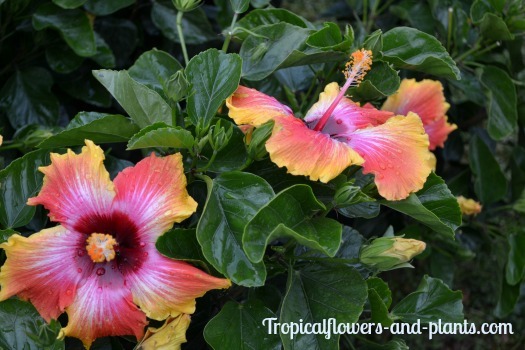 Fertilizing your Hibiscus plant plays an important role for the tropical plants growth. Regular feeding of the proper fertilizer will insure your growing Hibiscus to bloom beautifully and continue with healthy growth. When choosing a fertilizer you want to make sure it has three different elements. 1) Potassium helps the Hibiscus plant in all aspects, whether it is, drawing water to the plants cells, which hydrates the leaves making the leaves lusher, to assisting in photosynthesis. Potassium is not constructed into any section of the plant. Its sole function is to lock into chemicals to make the process work. When the plant begins to show signs of stress those floating ions (potassium) can easily be lost. Basically Potassium floats around in the plant, in no given area. Kinda like you would in a pool on a raft. If a section needs help he comes to the rescue. However, if the plant is struggling those are the first to go. 2) Nitrogen is another important element for Hibiscus plants. Nitrogen is used in the plants enzymes, chlorophyll, proteins and in majority of their metabolic process. You want to have a medium dosage of Nitrogen because too much of it will cause the leaves to burn and too little will bring the Hibiscuses growth to a standstill. Using too much of Nitrogen over time will boost leave development rather than flower production. 3) Phosphorus is one of the elements that you want very little of. Some plants may require more however Hibiscus are not one of those plants. Phosphorous holds up other minerals and nutrients which will not allow the roots to absorb the proper foods. I have spoke with several different nurseries that are currently growing Hibiscus to find the best products and procedures. One example: one week fertilize with miracle grow and the next week throw some Epsom salt around the roots. Second example: using a product called Dynamite. You can purchase this online or your local plant store. This type of fertilizer is time-released which means you only need to give it once during your growing season. Any time you add fertilizer to your growing Hibiscus plants you want to make sure you follow the directions on the package. There are several ways to disburse the fertilizer. 1) Mix water and fertilizer in a container. This process may take you longer to disburse, due to the size of container. However, if you are only fertilizing one plant at a time this process would be the best choice. 2) Attach a proportioner to your hose. As the water fills the small container it will mix the fertilizer up allowing you to control when you are just watering and when you are fertilizing. This process allows you to fertilize a large area in one watering session. 3) If you have a drip system you can purchase fertilizer injectors and add them to your system. TIP: Before fertilizing your growing Hibiscus wet the soil. When the soil is dry the nitrogen in the fertilizer can damage the plant by burning the roots. Growing Hibiscuses are heavy feeders and would rather be fed smaller amounts often, rather than large amounts occasionally. Throughout the spring and summer Hibiscus are actively growing. At this time you should be fertilizing often and on some kind of regimen. Bi Weekly= Full dosage of what directions require. If your schedule does not allow you enough time to fertilize as often as they require you can look into a time released fertilizer. Only negative about these fertilizers is that you may need to add a boost every couple months. When the seasons begin to change to the colder months you want to slowly back off of fertilizing. The Hibiscuses active growth will gradually slow down and not require as much food. During the colder months you will be cutting back on your fertilizing or not even fertilizing. This is the time that your Hibiscus becomes dormant.